Laura Mvula is the captivating neo-soul singer from Birmingham who released her debut album ‘Sing to the Moon’ back in 2013. Mvula’s journey to where she is today is an interesting one. She has a degree in composition from Birmingham Conservatoire, and has directed the Lichfield Community Gospel and Alvechurch Community Choirs. Her debut album peaked in the top 10 of the UK chart and she’s performed on The Graham Norton Show in the UK. Oh, and her debut was nominated for the Mercury Prize and has 2 MOBOs under her belt. Phew. Mvula has just released her second album ‘The Dreaming Room’, a heart-wrenching and uplifting collection of songs that draw from a myriad of influences. Mvula draws on neo-soul and classical inspirations, with stirring string instruments being heard alongside funky guitar hooks and powerful vocal arrangements. To begin, ‘Who I Am’ is, at just four short lines, is a subtly powerful introduction to the album with unearthly synth sounds and Mvula’s subdued voice. The final lyric ‘I can only be who I am’ feels like an indicator of things that are to come – the album itself deals with the struggle of identity. But, in addition to that, it speaks of the style of the rest of the album. In ‘The Dreaming Room’ Mvula has thrown away the rulebook and is making music the only way she knows how. Her way. ‘Overcome’, which features Nile Rodgers of Chic, is a moving anthem of overcoming oppression and finding freedom. ‘Overcome’ doesn’t feature an abundance of lyrics. It also doesn’t follow the typical style of verse-chorus-verse. Instead, it feels more like a poem, with four verses, ending with Mvula repeatedly singing “round the mountain all God’s children run”. Each verse is interspersed with and supported by soulful singing and a collection of sounds including strings, crashes of percussion, purring synth and an addictive guitar hook. 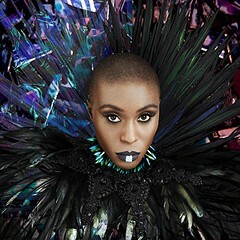 Mvula’s unique voice embodies a mixture of her classical training and Caribbean heritage. On ‘Let Me Fall’, the track features shimming synth sounds that accompany Mvula’s rich vocal range. Like ‘Overcome’, the structure of the song does not follow a typical arrangement. There is the chorus, with Mvula belting out “and if I fall / let me fall”. Cut about half way through the lyrics “no looking back when hope is pushing forward / hand in the sky will lead us out of the darkness” is repeated again and again like a sermon or a personal mantra. There are also range of drums, electronic murmurs and gentle “oohs” that float through the track, adding to the choral element of the track. ‘People’, which features rapper Wretch 32, marches along with a steady beat of drums and swelling vocals. This track is more overtly political with Mvula singing lyrics such as “our skin was a terrible thing to live in”, speaking of black identity. She sings of hope and community: “with hand in hand, we free our souls / remind us of our glory”. The lofty, vocal accompaniment and hammering of drums feels like a protest captured in song, reaching angelic heights as Mvula sings “how glorious / this light in us”, before Wretch 32 begins his verse, talking civil rights (“smell Martin Luther in the air”) and inequality. It’s a powerful track, one that definitely has to be heard. Then there’s the final track on the album, ‘Phenomenal Woman’. I knew that I’d like the song from the title alone. I just can’t help but feel excited about female empowerment in music. On hearing it for the first time, I felt the same way that I felt on first hearing Beyoncé’s ‘Formation’. ‘Phenomenal Woman’ is the perfect way to end the album that has dealt with overcoming adversity and feelings of being broken down: “Nobody ever told her she was beauty / one day she realised she was already free”. From the thundering bass and clanging echoes at the start of the song as Mvula begins to sing, to the roar of “oh my, she flies”, every part of it is addictive and anthemic. When Mvula cries, “you are phenomenal woman”, you can’t help but believe it. It’s a great powerhouse of a track and the perfect way to end the album. ‘The Dreaming Room’ speaks of the struggles of coming to terms with individuality. But it’s also an uplifting and hopeful collection of tracks that focus on positivity and moving past dark times. Laura Mvula’s sophomore album ‘The Dreaming Room’ is out now on RCA Records. Mvula will be appearing at some festivals this summer, including Latitude and Longitude.